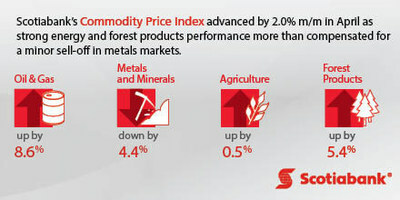 TORONTO, May 26, 2017 /CNW/ - The Scotiabank Commodity Price Index gaining 2.0% m/m in April as strong energy and forest products performance more than compensated for a minor sell-off in metals markets. Oil prices fell to their lowest levels in early May since the initial announcement of the OPEC/non-OPEC supply agreement before recovering on news of Saudi and Russian support for a 9-month extension of the deal. Despite this, the oil market recovery is still fragile and requires further production discipline from OPEC members and other large producers. "Our base case outlook for oil sees the market entering a supply deficit that will begin to draw down the inventory glut in OECD countries, and this is expected to accelerate in the latter half of 2017," said Rory Johnston, Commodity Economist at Scotiabank. "We expect that OECD industry inventory will return to more typical levels by mid-2018." The non-OPEC supply outlook is split between the expected surge in U.S. supply and the generally anemic production outside the Unites States. The OPEC deal successfully helped raise prices into the $50-55/bbl range and allowed U.S. shale producers to hedge most of their production through 2017 and into 2018 at a profitable return. Price certainty, coupled with ever-rising rig counts and efficiency gains, has prompted the adoption of an aggressive U.S. production forecast. The softwood lumber market is now managing through the fifth modern iteration of the Canada-U.S. softwood lumber dispute. In late-April, five Canadian softwood producers were assigned specific tariff rates ranging from 3.02% to 24.12%, with the remainder of the Canadian industry subject to a 19.88% tariff. Demand for softwood lumber, used primarily in the construction and refurbishment of houses, is relatively inelastic. Lumber accounts for a small component of aggregate home-building costs and neither homebuilders nor buyers are likely to materially change their behaviour due to an increase in softwood prices. The effect of these duties on Canadian softwood lumber exports is a price increase that is absorbed by U.S. consumers as Canadian lumber is shifted higher on the regional cost curve. U.S. softwood lumber consumption far outstrips its domestic capacity and demand is expected to continue rising on the back of housing sector strength. The natural gas market is tightening after the two warmest winters on record (2015/16) depressed winter heating demand and left North American inventories glutted. The Metals & Minerals index fell 4.4% m/m in April as the industrial metals complex continued to suffer on the back of some general concerns about the strength of China's economy, with iron ore leading the pack down. Metallurgical coal prices have also fallen back from their Cyclone Debbie-fueled spike to above $310/t, most recently trading around $160/t. Nickel prices continue to be driven lower by supply considerations after falling from their politically-fueled highs of roughly $5/lb in 1Q17 to nearer $4/lb today. Aluminium prices have followed the rest of the base metals complex down, but remain more than 20% higher than the beginning of 4Q16.